A lot of people don't get my humor. My mom calls it dry humor. I think that means "not funny," but it also means I'm the only one who ever knows it's a joke. "This is not-hotel related. Except for the fact that the hotel serves as a the backdrop." "For REDRUM?" I ask in a croaky voice. "I've needed my morning hot chocolate, but someone got me addicted to it then took it away." "Is that your subtle way of saying you missed me last week?" "I've missed hot chocolate. I just think of you as the guy who brings it to me. Sometimes I forget your name and call you hot chocolate guy." I've been in the worst reading slumping - not the best way to start out the year - but this book pulled me right out of it. I read this book in two days and when I was at work, it was all I could think about. To say that Caymen is sarcastic would be an understatement. Her attitude reminds me so much of myself that I find it impossible to not connect with her character. Throughout the novel, she expressed every sarcastic comment that came to mind with the exception of those that would be confrontational. I also really liked Xander, but this is definitely one of those books where I wish I had both narratives. Maybe I'm just too jaded but some of the things he would come up in just seemed too convenient. Unfortunately I can't give an example without giving a spoiler, but it was just one of those things. His explanations made sense, but for those of who have been through the ringer was or twice, you're still pretty skeptical. That's not to say I didn't like the relationship and the banter between Caymen and Xander - I loved it! While it may sound like that cliche rich boy/poor girl plot line, it is anything but. Both characters and stuck in a future they don't want and begin challenging one another to find what it is they do love, sort of like a career day, but Caymen picks for Xander and the other way around. They take turns helping the other find their passion and the relationship they build is just too cute. 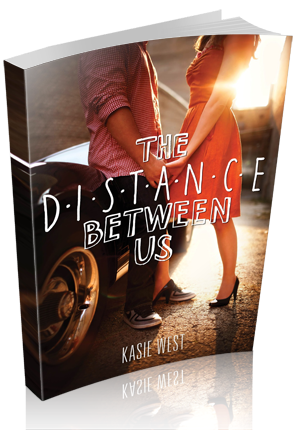 I became an immediate Kasie West through reading The Distance Between Us and honestly I don't know why anybody wouldn't be. This story was fun, cute, swoon worthy, and a super quick read and just exactly what I needed.